Burnt vs. Burned: What’s the Difference? Home » Burnt vs. Burned: What’s the Difference? Languages can evolve over time. English, despite being a relatively young language, is no exception. Sometimes, what is considered correct at one point in time may shift, and something else may take its place. In some cases, after enough time, the language might shift back. One good example is spelling. Often, the same word may have more than one correct spelling, depending on usage. Since English is spoken all over the world, conventions can vary based on regional differences as well. This is the case with burned and burnt. Both are correct, but have been used differently at different times and in different places, which makes choosing burned or burnt complicated. 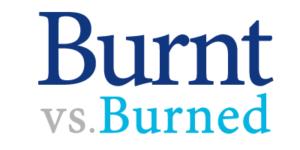 Burned vs Burnt: What’s the Difference? What is the difference between burned and burnt? In this article, I’ll explain the difference between burned and burnt, and use each in a sentence. I’ll also give you a handy trick to remember when to use each word. Burned is the past tense form of the verb burn. Burn is a regular English verb. It can be conjugated in past tense simply by adding the suffix -ed, in this case, forming burned. Burned is used to describe something that was damaged by fire in the past. What does burnt mean? Burnt also represents the past tense of burn. Traditionally, this spelling has been more common in British English and in other places outside North America. Someone might say, “she burnt my toast” without committing a spelling error. Like burned, burnt can also be used as an adjective. A child might say, “Give me the crayon called burnt orange.” and this, too, would be correct. It doesn’t make much difference whether you use burnt or burned in this instance. While burnt is an acceptable spelling, its use as a verb is considered outdated in American English. Burnt is still used as an adjective, though not widely. As you can see in the chart below, which graphs usage of the two words in books written in English since 1800, burned is the much more widely used variation, and has been since roughly 1880. The above chart isn’t scientific, and it only counts books, to the exclusion of other types of written and spoken media. It’s still useful for identifying a clearly defined, long-term trend, which shows burned to be the preferred inflection in American English. Even in Great Britain, where burnt has been favored for quite some time, appears to be shifting its use of the words. The above chart graphs burned vs. burnt just in British English, and it appears that burned may have overtaken burnt a few years ago, but the difference between the two is too close to tell. It can be difficult to remember the appropriate times to use burned or burnt, especially because neither is technically incorrect. One way to differentiate usage cases is to keep in mind that burnt and Britain both have a T in them. Burnt is more commonly used in British English, so linking them together with the T should help you remember. Is it burnt or burned? Burnt and burned can both be used as either a verb in the past tense or as an adjective. Burned is more common worldwide. Burnt is primarily used outside North America. You can easily remember this by remembering that burnt and Britain both feature a T, and burnt is more widely used in British English. 1 Burned vs Burnt: What’s the Difference? 7 Summary: Burnt or Burned? Angel vs. Angle: What’s the Difference? Forty or Fourty: What’s the Difference?